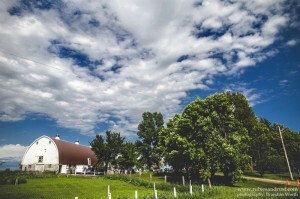 A wed­ding barn locat­ed in the greater Twin Cities area, about 40 miles south from Min­neapo­lis, MN. If you are think­ing of get­ting mar­ried in a barn in Min­neso­ta the rus­tic ele­gance of this one will delight you and add a mag­i­cal warmth to your wed­ding. 1) The house to get ready in. 2) The barn that has a roman­tic feel­ing of crys­tal chan­de­liers on the first floor and a cathe­dral-like ceil­ing on the 2nd.